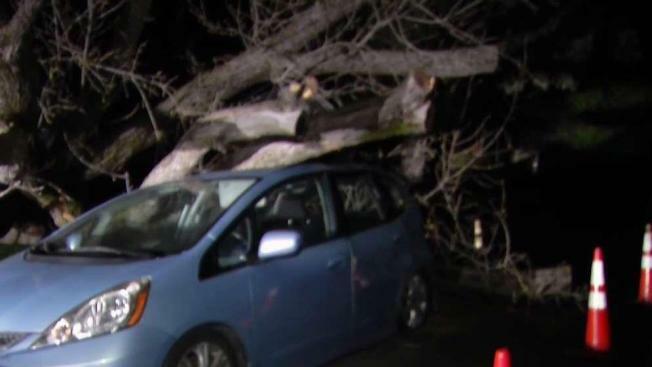 A huge tree crashed onto two cars in Pleasant Hill overnight Friday after the area experienced days of rain. The 4 to 5 feet wide and almost 80 feet tall tree fell onto the Lovett's family cars parked outside their home on Keats Circle, just off of Oak Park. No one was injured. Lauren Lovett said she "heard what sounded like raccoons fighting and then a really loud crash." She heard the car alarms go off and that's when she realized the tree had fallen over. NBC Bay Area's meteorologist Kari Hall said the area picked up about two inches of rain in latest storm. The Lovetts said they believe that's what caused the tree to fall down. "It's a shame. It really is because the tree's been here a long, long time," Matt Lovett said. The rain was much worse elsewhere in California. The three-day storm had spared communities a repeat of the deadly debris flows following a deluge earlier this year, it dumped record rainfall in some parts and unleashed flooding that led to dramatic rescues Thursday from Los Angeles in Southern California all the way to Folsom, some 400 miles to the north.